But after 12 years in office and a difficult election last year, and with a successor waiting in the wings, Ms. Merkel now appears to be receding in influence. It is a vacuum into which the young Mr. Macron has eagerly stepped. “Merkel is going to Washington and it looks like the U.S. just doesn’t care,” said Jeremy Shapiro, a former State Department official who worked on European affairs under former President Barack Obama. Seasoned diplomats on both sides of the Atlantic insist that American-German relations remain critically important. Germany remains the richest, most populous country in Europe. It is still the Continent’s powerhouse and an important American economic partner. German companies employ roughly 700,000 people in the United States. Mr. Macron may be the one who has captured the imagination of fellow Europeans, but even he needs Berlin to push through any meaningful change in the functioning of the European Union. “Never underestimate Merkel,” said Joseph Braml, a trans-Atlantic expert at the German Council on Foreign Relations. In Berlin, German officials played down the symbolism of this week’s twin visits — though not without a hint of frustration: “Let him enjoy the nice photos — she is going there to work,” said Peter Beyer, the government’s coordinator of trans-Atlantic relations. Ms. Merkel and Mr. Macron had consulted each other closely before traveling across the Atlantic, Mr. Beyer said. They want the same things from Mr. Trump: A permanent exemption from United States steel and aluminum tariffs and the survival of the Iran nuclear deal (neither of which officials here expected them to obtain). 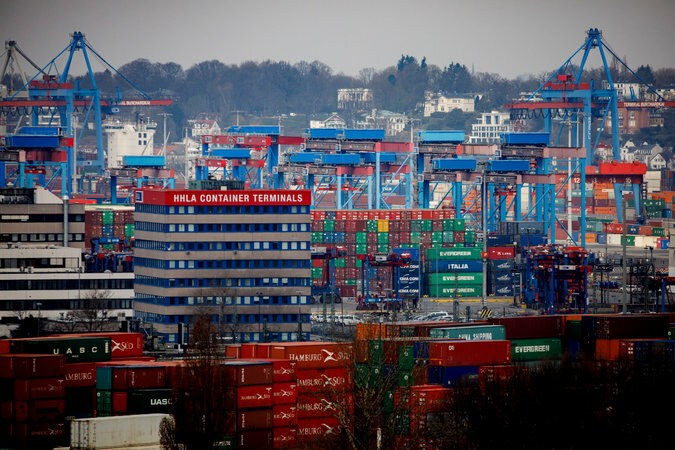 Shipping containers at the port in Hamburg. Germany’s chronic trade surplus with the United States is a particular bugbear for Mr. Trump. On May 1, a temporary exemption from the tariffs for European Union countries expires. Two weeks later, the Iran deal could expire, too. But when it comes to foreign policy, France and Germany diverge sharply and in a way that analysts say has influenced their relationships with Mr. Trump. Unlike France, Germany did not take part in the recent airstrikes against Syria. And unlike France, Germany is far from spending 2 percent of its G.D.P. on its ailing military, mocked even at home for its fleet of defective submarines and grounded transport planes. “German foreign policy seems overwhelmed by the tensions at home, in Europe and beyond,” Constanze Stelzenmüller of the think tank the Brookings Institution wrote in the newspaper Süddeutsche Zeitung. Few leaders seem less personally in sync with Mr. Trump than Ms. Merkel. Estranged by widely diverging temperaments and leadership styles, the two leaders have also clashed on substance — from climate change and military spending to Germany’s chronic, yawning trade surplus with the United States, a particular bugbear of the president. “The Germans are bad, very bad,” Mr. Trump said during a meeting with European Union trade negotiators last May. For her part, Mr. Merkel had greeted Mr. Trump immediately after his election with a stern reminder about the need to protect and preserve democratic values. But 18 months later, German-American relations, analysts and officials reckon, are at rock bottom. 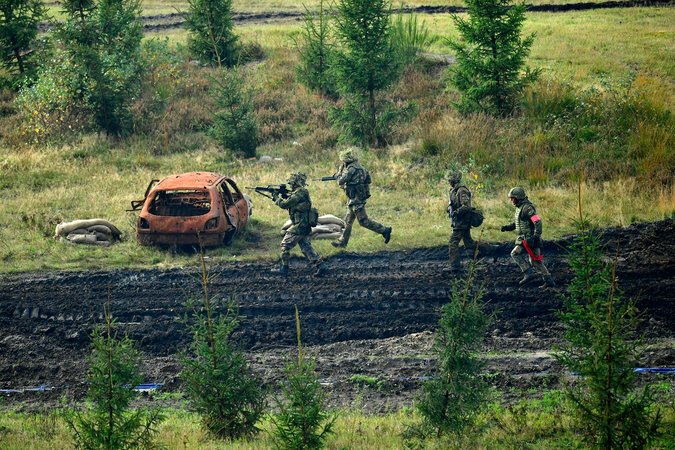 German armed forces during military exercises near Münster last year. Mr. Trump and Ms. Merkel’s views on military spending are wide apart. Even inside Ms. Merkel’s own conservative party, many worry that the chancellor needs to change her strategy in order to be heard in Washington. “Trump will only listen to Germany if we put tangible proposals on the table and go beyond the proclamation of our common values,” said Jacob Schrot, founder of the Young Trans-Atlantic Initiative and a foreign policy adviser in Parliament. Increasing military spending to put Germany on track for its commitment to spend 2 percent of G.D.P. on the military by 2024 would be one thing, he said. Rallying the European Union behind Mr. Trump’s criticism of China for unfair trade practices would be another. And offering to put pressure on Moscow over Syria a third. But United States officials say the only thing that would really get Mr. Trump’s attention is if Germany started buying American military equipment. Earlier this week, the German defense minister, Ursula von der Leyen, laid out a 450 million euro — about $550 million — procurement plan for military equipment, from rocket launchers to helicopters. “This is about the sustainability of our military and the reliability of Germany vis-à-vis our close partners,” she told the Sunday edition of the tabloid newspaper Bild. The timing seems deliberate, said Mr. Tuschhoff of the Free University. Few analysts expect any immediate breakthroughs or big announcements in the joint news conference scheduled after Friday’s working lunch. And some questioned whether in the end personal chemistry mattered much at all. The warmth between Mr. Macron and Mr. Trump may make for fun headlines and slightly better atmospherics in meetings, but it will not change the logic of the “America First” doctrine, Mr. Braml said. Mr. Shapiro, the former State Department official, agreed. “No one has ever gotten anything from these relationships,” he said.